Hellcat version will make more than 600 horsepower. Following its unveiling of the new Challenger at the New York Auto Show, Dodge today revealed the insane SRT version of the car. 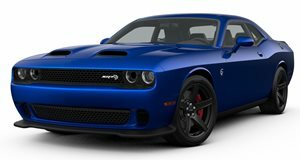 The Challenger SRT will be available in two versions, one of them – the Hellcat – equipped with a 6.2-liter supercharged HEMI V8 producing more than 600 horsepower. 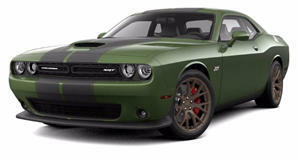 The lesser version of the car, the Challenger SRT 392, will carry over the previous generation’s 6.4-liter HEMI V8, making 485 hp and 475 lb-ft of torque. Both versions will be rear-wheel drive, with the engines mated to six-speed manual transmissions or optional TorqueFlite eight-speed automatics with paddle shifters. Both SRT models are also equipped with Drive Modes, a feature which allows drivers to manually control horsepower, transmission shift speeds, steering, paddle shifter response, suspension and traction. The models will be built at Dodge’s Brampton factory in Canada, and are due to hit showrooms in the latter part of this year.